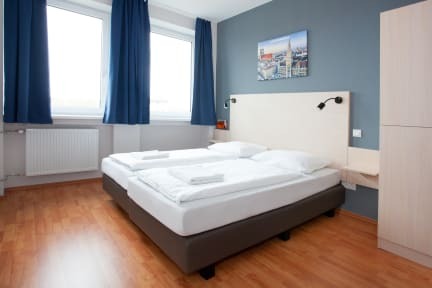 The a&o München Laim offers its guests soon different rooms in the categories single- and double rooms, family- and shared room, all with its own shower and toilet. 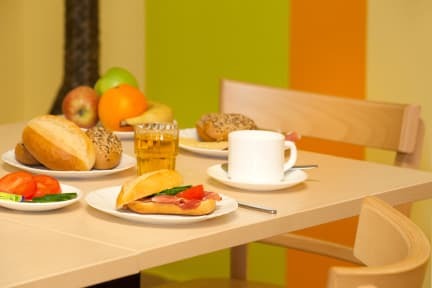 Cheap accommodation in the city of traditions will be possible in the latest a&o München Laim in the hostel- , as well as in the hotel area. The shared rooms are like the rest of the entire house brand new and offer beside comfortable mattresses always a separate shower and toilet in the room. The single, double and family rooms which constitute the hotel area of the a&o München Laim are spacious and modern designed. Great place, with good atmosphere and friendly and helpful staff. Highly recommended. Great place to stay in Munich! Great location! Great room! Great bathroom! Very clean! Free wifi and free towels! Had a great time! Good Hostel to spend time with family and friends. I spent 7 days at this hostel. Overall I had a good stay. My room was clean and the staff was helpful. The location is 8 mins away on foot from the nearest train station. Not many restaurants nearby so you have to walk further and take the bus. Overall, my friend and I had a great stay. It was about an 8 min walk to the train station and not too far from the center. My bunk bed made noise anytime it moved which woke me up throughout the night, but the bed itself was comfy. Clean, and spacious room. Any concerns we had, the staff dealt with right away and made our stay more comfortable! Overall, a decent place to stay inexpensively. A few miles from Munich. Staff was friendly. Could be a bit cleaner. It was the worse hostel experience for me and my friend. Staff is not friendly. They cost for everything even for bed sheets you have to pay 3,5 euro. They didn't tell us this situation and I had to wake up at 1 am in the night and bought a sheet from reception cause I laid down other one's bed. Hostel location is far from centre. There are a train station 15 min and a tram 25 min walk away. The hostel is near train station so there are so much noise. Think about it twice before booking.